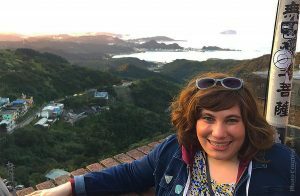 On September 1st, 2017, I stepped on to the Celebrity Solstice and started my Alaskan adventure. It was the first cruise I have ever taken. I’ve been on many Ferry rides across the Puget Sound, but I was always afraid to go on a cruise because of accessibility concerns. I was born in 1979, with an unknown storage disease which left me quadriplegic, therefore I use a wheelchair to get around. 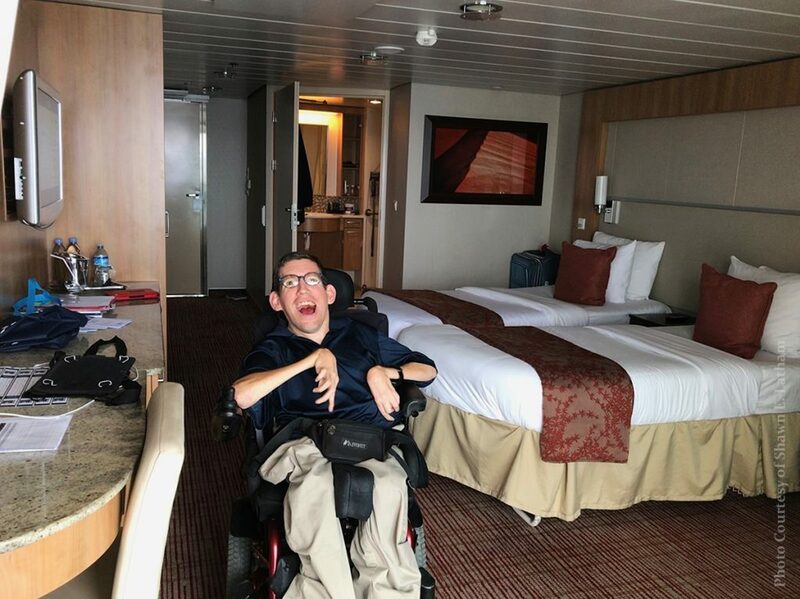 While I was very excited to go on a cruise because I love being on water, I was afraid it wouldn’t be as accessible as a mainland hotel is for me. The following is my experience on the Celebrity Solstice. Once we got to Pier 91 in Seattle, it was an awesome feeling. 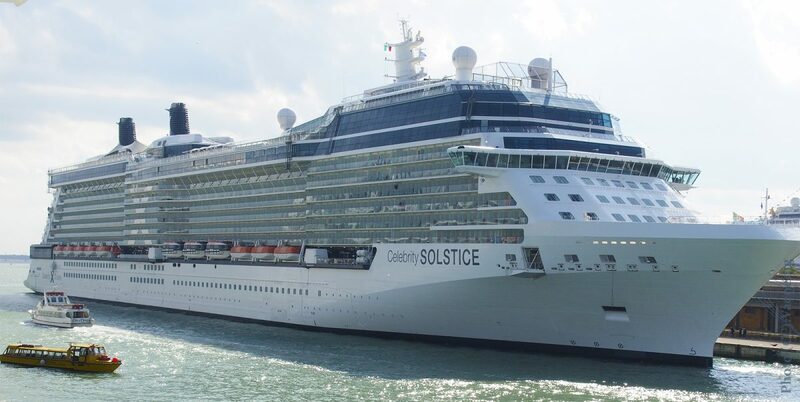 Seeing the Celebrity Solstice up close makes everything looks so small. Even ferry boats look small compared to them. My mom, Sandy, who was on the trip with me, and I had to go through several steps before boarding. First the baggage worker took our bags from us and placed them at the door of our stateroom. We then went through check in and customs. There was an accessible check in desk available for me to drive up to although it was still higher than my chair. The cruise customs were very similar to airports. The port employee pulled me aside and checked my wheelchair for explosive or other dangerous materials. You will be happy to know I passed with flying colors. We then took the windy boarding ramp up to the ship. 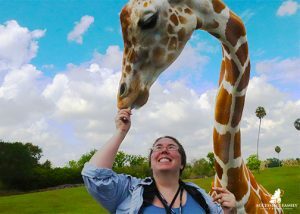 It was pretty cool for me, since I like mazes but it might be a lot of walking for others. Also, be aware that along the way, people will continually ask for your boarding pass and your passport so keep them handy. Aboard the ship, the crew was very welcoming. They gave us drinks and pointed us to the nearest elevator. We boarded on the fourth floor and our state room was on the sixth floor. As one might imagine the elevator was pretty busy then. There were always people in the elevators the whole trip and often we had to wait for one. On the sixth floor, we went down a long hallway to our stateroom #6139. The stateroom had a special disability entrance, where you stick the room key into an accessible doorway slot and the door would open automatically. I would have preferred a code entry myself, but this works too! There was a push button on the inside of the room to get the door to open when in the room. The door itself was 32’ very accessible for me. For comparison, normal staterooms doors were around 23’. The room itself was very spacious 194 square feet living and bathroom area. The room also had a 54 square feet balcony. The room had two twin beds that could move around some. This made it easy for me turn around in the room. I could also move close to the bed to pivot. The rest of room including a desk, closet, safe and fridge was mostly accessible with minor assistance from my mom. Passengers should be aware everything in the fridge cost money. The balcony in my opinion a must have on a long cruise. We had a sliding door to look out. The balcony allowed me to go out, see the sights and turn around to get back in. While I don’t have the exact specs for the restroom it was pretty big. The restroom had grab bars by the toilet and by the roll in shower. Due to my short stature, I brought my own equipment since I needed extra support. However, for most travelers the grab bars in the restroom should work. As I mentioned in my stateroom there was a roll-in shower. Some of the other accessible rooms came with bath tubs. The roll-in shower was tight, I could pull up to it but there was not enough room to drive in. This made transfers a little hard. The on-board experience of the Cruise, was my favorite part of the cruise. First on the 14th floor which had amazing views there was the Ocean View Café ,an all you can eat restaurant. For the most part, the food was great, but very similar day by day. That said, there was enough different foods so until the last day I didn’t get bored. The staff there and at other restaurants were great about helping me get food if I asked. Speaking of other restaurants, the ship had a main lunch and dinner place where I sat at the same table each night. I would say to anyone on board you must try the lamb, it was delicious! The ship also had five specialty restaurants that had unique menus but costs each time you use them. The other main highlight was the Solstice Theater. The theater had over a dozen accessible locations, although every seat fills up fast there. Each night the theater held a concert or theater performance. In day daytime, there were nature talks. The ship was full of other places to have fun and most were fully accessible. 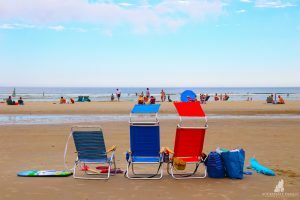 Finally, you might be wondering about the excursions. 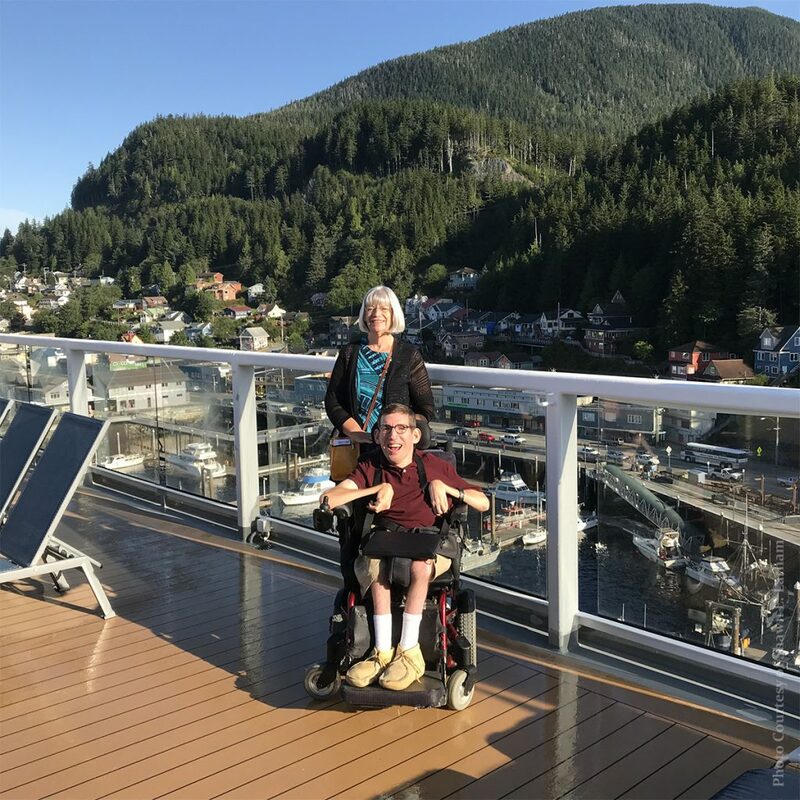 The cruise ship was very good about letting wheelchairs off when we were docked in Ketchikan and Juneau, but when we got to Icy Strait they had to use tender boats that aren’t fully accessible. People have to be able to walk on to the Tender boats, so power wheelchair users won’t be able to get on those boats. Another thing to note is most excursions aren’t wheelchair accessible. This doesn’t mean I didn’t have fun getting off, it just meant I had to make my own plans. Overall, my cruise experience was fabulous and I can’t wait to get back on the waters. 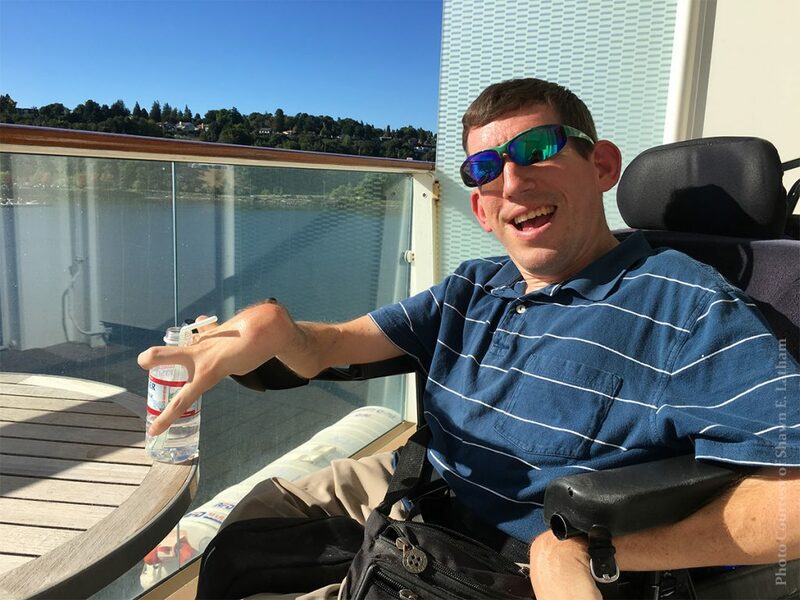 Shawn E. Latham is a disability advocate from Sedro Woolley, Washington. Shawn currently works as an Independent Living Coordinator at the Center for Independence in Marysville. He is also the Chair of the Disability Coalition Allies in Advocacy as well as being a member of several other groups and boards. Shawn is dedicated to making sure all people with disabilities have the ability to lead happy successful lives. Shawn loves watching sci-fi movies, reading novels, attending church and having fun with friends and family. You can contact Shawn at [email protected] or tweet him @Abilities4all. Sure, so on the Celebrity Solstice the theater is three floors high. The stage is on the 3rd floor. The seating goes from the bottom of the 3rd floor to the 4th floor entrance and then from the 4th to the 5th floors. On the 4th and 5th floors there are very good views at the tops of the floors. The 4th are the best views. Now there are a few beams that you don’t want to sit close to so you will need to pick your spot carefully. For Celebrity its first come first serve so getting there 20 to 30 minutes early means you get a good area. Lastly the wheelchair seating is also senior seating where the chairs can be pulled in and out, which is the big reason to get to the theater early. Hope that helps!